Broken Triads – Ascending or Descending? Broken Triads – Is the Triad Ascending or Descending? Broken Triads using games are fun for visual, auditory or kinesthetic learners. I was immersed in music from before I was born. 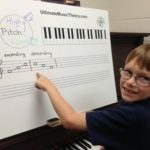 As a second generation music teacher, I have always been surrounded by music and spent many hours playing Broken Triads pitch games with my mom. I naively assumed that all children were as blessed musically as I was. Me: “ummmmm…okay….” And yes, my student and I shared that awkward “deer in the headlight” moment. I truly did not realize that not all children had the same comprehension of pitch – of what it means when a sound ascends (gets higher) or descends (gets lower). In actuality, students often struggle with the basic concept of high and low! I began working Ear Training games into my Theory Lessons to help students become comfortable with pitch. Here is one game that my students really enjoy! In Prep 2 Rudiments, students are introduced to Solid and Broken Tonic Triads. Using the Whiteboard, review the ascending and descending broken triad patterns – all lines or all spaces. Notice how ascending broken triads skip up and descending broken triads skip down. The Large Teacher Whiteboard comes with a stand and 5 different colored markers. I like to use blue arrows to show up/ascending patterns and green arrows to show down/descending patterns. Now for the fun part! The student stands beside the piano. With their eyes closed (or looking away from the piano), they listen to the teacher play a triad. Is the triad ascending or descending? Is the pitch going up (getting higher) or is it going down (getting lower). Broken Triads - Write, sing or sign the answer! This Ear Training Game builds a foundation in pitch and intervals. 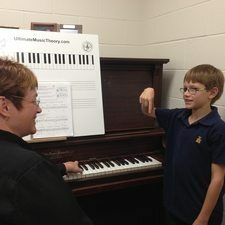 Students learn to hear and sing the distances of a Major 3 and a minor 3. And they get to have fun! For even more fun – switch places! Have your student play the ascending or descending broken triads and you identify the direction of the pitch! 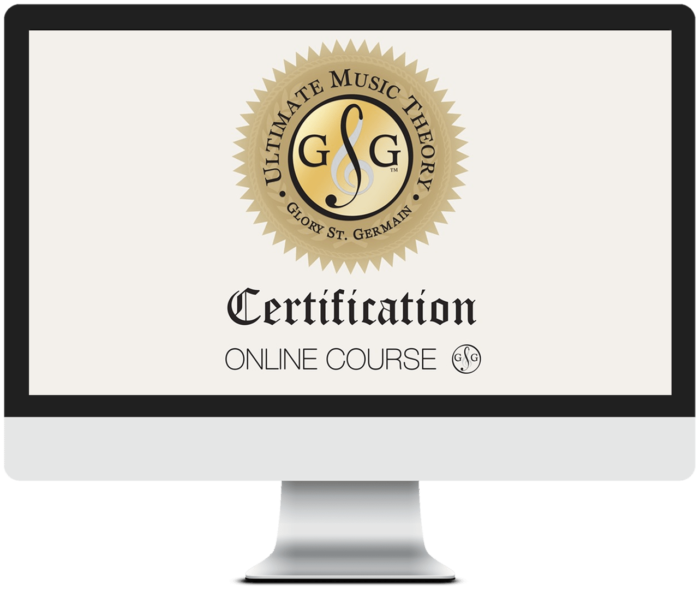 The Ultimate Music Theory Whiteboards are a fantastic resource for teachers. They enable you to take just about any theory concept and make a game out of it! P.S. – Join the Conversation! Try this Ear Training Game with your students and share your experience with us. 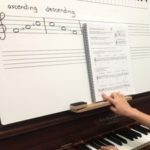 Did your student immediately hear the difference between the ascending and descending triads? Did you take turns being the person who played the triads on the piano? up or down for visual then worked with the sounds! Fun to see them understand the concept! It IS fun! I love when they get that “ah-HA” light bulb moment. It makes my day!